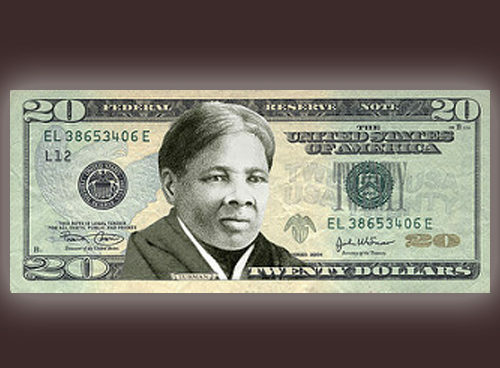 After extensive public debate, Jacob Lew, Secretary of the Treasury, announced that Harriet Tubman will replace President Andrew Jackson on the front of the $20 bill and the reverses of the $5 and $10 will also be redesigned to include several other notable women in U.S. history. That the Secretary of the Treasury be, and is hereby authorized, in case he shall think it expedient to procure said notes, or any part thereof, to be engraved, printed, and executed, in such form as he shall prescribe, at the Treasury Department in Washington, and under his direction; and he is hereby empowered to purchase and provide all machinery and materials, and to employ such persons and appoint such officers as may be necessary for this purpose. The current portraits currently featured on U.S. paper currency were adopted in 1929 when the size of the notes was reduced and designs were standardized. The designs were selected by a special committee appointed by the Secretary of the Treasury. It selected Presidents of the United States, including George Washington, Thomas Jefferson, Abraham Lincoln, and Andrew Jackson, because of their long-lasting regard in the eye of the American public. Secretary of the Treasury Andrew Mellon also opted to include three statesmen that also played pivotal roles in U.S. history — Alexander Hamilton, the First Secretary of the Treasury; Salmon P. Chase, Secretary of the Treasury during the Civil War and an advocate for the National Banking System; and Benjamin Franklin, Founding Father and one of the signers of the Declaration of Independence. Pursuant to 31 U.S.C. § 5114(b), only the portrait of a deceased individual may be used on U.S. currency. Martha Washington is the only woman whose portrait has appeared on paper currency. The First Lady was featured on the face of the $1 Silver Certificate of 1886 and 1891, and the back of the $1 Silver Certificate of 1896. No African Americans have been pictured on U.S. currency. Millions of Americans voiced their opinions regarding the new face of the $10, which was deemed by the Advanced Counterfeit Deterrence (ACD) program to be most in need of an update. The Treasury Department received feedback via emails, social media, roundtable discussions, and handwritten letters. The Treasury received numerous suggestions of female honorees, including Harriet Tubman, Susan B. Anthony, Rosa Parks, and Eleanor Roosevelt. The controversy erupted over which man they should usurp. Many argued that President Andrew Jackson should be replaced on the $20 bill rather than Alexander Hamilton on the $10 bill, citing that Hamilton played a pivotal role in the founding of our country and also served as the country’s First Secretary of the Treasury. Hamilton also arguably received a great deal of support in large part to the wildly successful Broadway show that bears his name. While Jackson was the country’s seventh Presidency, his legacy is tarnished by a history of violence against Native Americans and resistance to a national banking system. To address many of the concerns raised by the public, the Treasury Department will redesign the $20, $10, and $5 dollar notes. The new currency will be unveiled in 2020 to commemorate the 100th anniversary of the 19th Amendment, which granted women the right to vote. The front of the new $20 bill will feature the portrait of Harriet Tubman, who helped other slaves escape to freedom as a conductor on the Underground Railroad. The newly designed reverse will include The White House and an image of President Andrew Jackson. In response to public outcry, Hamilton will remain on the front of the $10 bill. The reverse will pay homage to the leaders of women’s suffrage movement, including Susan B. Anthony, Elizabeth Cady Stanton, and Sojourner Truth, and depict the March of 1913 from the U.S. Capitol to the steps of the Treasury Department. The reverse of the new $5 will also be redesigned to feature historic events that occurred at the Lincoln Memorial. The images of opera signer Marian Anderson and First Lady Eleanor Roosevelt will commemorate Anderson’s concert, which took place at the Lincoln Memorial with the help of Roosevelt after the Daughters of the American Revolution refused to allow her to perform at Constitution Hall. Martin Luther King Jr., who delivered his historic “I Have a Dream” speech at the memorial, will also be featured. The front of the new $5 will retain President Lincoln’s portrait.